Today's defence-related news includes reports on no deal Brexit preparations. Widespread coverage in today’s newspapers on the Ministry of Defence’s contribution to cross government contingency preparations in case of a no deal Brexit. The Metro and Daily Mail report that more than 3,000 military officers are on standby in case of no-deal Brexit. 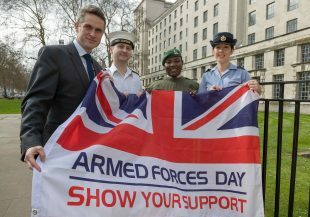 Pictured is Defence Secretary, Gavin Williamson with representatives from the Royal Navy, Army and Royal Air Force, together to launch the '100 Days To Go Until Armed Forces Day'.